This article is an introduction to a system for understanding the dynamics of personal growth and personality development, using the language and concepts developed by Carl Jung, Isabel Myers, Katharine Briggs and the personality system that has developed around the Myers-Briggs Type Indicator (MBTI)*. The Faces model is based on the theory of eight mental functions, developed by John Beebe, Harold Grant and other Jungian theorists. Readers unfamiliar with this theory can obtain an introduction by reading the Ken Green article in the "Best of the Bulletin of Psychological Type" (Volume 1, Chapter 2). The Appendix at the end of this article also will be helpful. Using the Myers-Briggs for Career Planning. How to verify your Myers-Briggs or MBTI type score. Index of MBTI Personality Type Articles for Educators & Students. The "Faces" article below was originally written for the "Bulletin of Psychological Type" and an audience quite familiar with Myers-Briggs and Jung Personality Type Theory. Take our online self-scoring "Personality Test" and learn more about Personality Types & the MBTI. * While commonly referred to as the Briggs Myers personality test, Myers Briggs Test or the MBTI test, the MBTI ® is not a personality test but a personality inventory or instrument in which there are no right or wrong answers. The idea of a duality in character or personality is not new in psychology, literature, nor our everyday relationships with people. I suspect most everyone has at some time "been of two minds" over a situation - caught in a struggle between two contradictory impulses or courses of action, each having strong appeal, yet coming from different sides of our nature. And who has not discovered that many people display a different nature "once you get to know" them? Likewise, the idea is well accepted that many people have a distinctly different public and private persona. Yet this duality of our nature has been largely overshadowed by real or fictional cases involving abnormal extremes. Robert Louis Stevenson helped nudge this along in the Strange Case of Dr. Jekyll & Mr. Hyde. The dramatic portrayal by Joanne Woodward of the Three Faces of Eve is another example as is the pejorative declaration that "so and so" is "two-faced." The penchant of conventional psychology to identify personality traits along a unwell/well scale helped "abnormalize" our dual nature. Having more than one "personality" is considered a disorder: Multiple Personality Disorder. At the sub-clinical level, while not considered serious clinically, showing "two different faces" is not healthy. Being "two-faced" is considered not a good thing to be! This assertion stems from Carl Jung's discovery that all people have both an extraverted and introverted nature. Yet, again, the influence of trait psychology has clouded this distinction by converting the preferences into a scale, with I at one extreme and E at the other and a midpoint in between. So it has been seductively easy to fall into the trap of classifying people along this scale depending on which side of the midpoint a person fell. Even serious students of psychological type and admirers of Isabel Myers are guilty of talking about Introverts and Extroverts - as if Introverts have no extraverted nature and Extraverts have no introverted nature. In commenting on this modern day distortion of his mother's work at a conference in the Spring of 2000, Peter Myers was quoted as saying: "There are no extraverts. There are 8 functions." He further explained that his mother was forced to linearize MBTI type preferences in scale form because all the statistics at the time applied to traits. The eight functions Peter Myers' referenced are: the introverted and extraverted expressions of the four Jungian mental functions of Sensing, Intuition, Thinking, and Feeling. The shorthand designations of these functions use the lower case "e" or "i" to distinguish the two different expressions. Thus Se is extraverted sensing and Si is introverted sensing. These eight functions are described in Chapter 8 of Gifts Differing and were originally drawn by Peter's grandmother - Katherine Briggs - from her reading of Jung's Psychological Types. The four MBTI type letters are too often misconstrued as the component parts of a whole as in INTJ = I+N+T+J. Wherein in reality INTJ is the code designation for a distinct pattern of how the 8 functions interact and result in a "whole type." The longhand version of this code would write out the order of the 8 functions from most dominant and conscious to most inferior and unconscious. Thus INTJ refers to the following pattern of mental functions: Ni, Te, Fi, Se, Ne, Ti, Fe, and Si. Expressed in this way, the wholeness of type, in encompassing all the functions and attitudes is more evident. Later in this article, I'll discuss how this unique pattern of functions relates to personality development and psychological growth. Because of the influence of "trait" psychology on how we think about personality, it is easy for the type practitioner to lose sight of the fact that Jung's theory of types is not based on observable traits or behavior. When we talk about Type, we are actually talking about something that is hidden beneath the collection of traits and behaviors we think about when using the term personality. A person's "Type" may be something we can infer from traits and behaviors, yet we cannot directly observe it. If we examine the root of the word personality ("persona") we discover it means "mask." So the origin of the term suggests the early philosopher-psychologists believed the real self was hidden beneath the mask of personality. When we observe in others consistent patterns of behavior, we are seeing, not type itself, but the influence of what I call the Faces of Type. The Faces are pair patterns of Judging and Perceiving mental functions (ST, SF, NT & NF). There is a unique combination associated with each type. Each of the 16 types has two primary Type Faces (derived from the fact that each of us responds to both E and I energy sources): a more public outer-energized face and a more private inner-energized one. While these faces hide the true type, they are not masks in the sense of being false because they are a part of the overall Gestalt of type. They are extrapolations of our type. While our Myers-Briggs Type is a lifelong constant, the Type Faces are the building blocks of a maturing and developing personality. Jungian analyst John Giannini (Compass of the Soul:Archetypical Guides to a Fuller Life, 2004) believes the four primary pairings of judging and perceiving mental functions (ST, SF, NF, and NT) represent the fundamental Jungian archetypes of the Briggs & Myers' model. These 4 basic archetypes can be expanded to 16 by having them be expressed in either the E or I attitude and by which of the two functions in the pair takes the lead (is the principle function). For example, when ST is introverted it plays out somewhat differently than when it is extraverted; likewise when the coupling is reversed in order with Thinking predominant (TS) we get two more variations on the general theme of the pairing of Sensing-Thinking. While these four primary archetypes are imprinted in the psyche of everyone, the unique patterns of the 16 types will favor expression of these these four primary archetypes in an order characteristic to each type. I chose to call these archetypical expressions "Faces" because I think the average person is more familiar with the notion of people having more than one "face" than they are with the more sophisticated and mystical sounding word "archetype." How are the particular patterns of Personality Type Faces determined? Our 2 primary faces are anchored by our two most preferred mental functions, indicated by the middle two type letters. One anchors the extraverted face, the other the introverted face. The remaining two mental functions are aligned in a complimentary and supporting role to more fully define the two primary faces. So each Face has both a judging and a perceiving function. 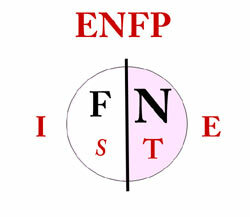 The diagrams below illustrates this pattern for ENFP. * The subscripts "i" and "e" appended to the mental function letters signify the "introverted" or "extraverted" expression of the mental function. Thus Fe is extraverted Feeling; Fi is introverted Feeling. For More on Carl Jung's Theory of Psychological Types, See "Lenore Thomson on Personality Type & Carl Jung"
*While sometimes referred to as the Myers-Briggs Personality Test, the Briggs Myers personality test, Myers Briggs Test or the MBTI test, the MBTI ® is not a personality test but a personality inventory or instrument in which there are no right or wrong answers.